On the eleventh of this month [January], we commemorate our Holy Father Theodosios the Cenobiarch. As a common monastic you lost your life. On the eleventh the Cenobiarch departed this life. 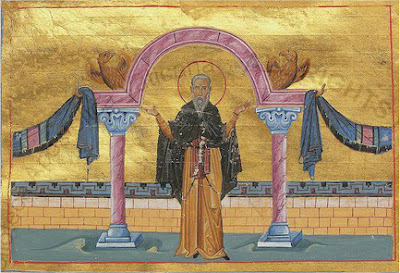 This Saint lived during the times of Emperor Leo the Great (457-474), and reached the times of Emperor Anastasios Dikoros (491-518). He was from a village in Cappadocia called Mogarissus, and was the son of pious and faithful parents, his father called Proairesios and his mother called Eulogia. Having become a monk, he went to Jerusalem, and from there to Antioch, and he met Saint Symeon the Stylite, from whom he learned about the increase he would receive in virtue, and that he would become a shepherd of many rational sheep. Then he went to live in quietude near a hesychast man, whose name was Longinus, and he occupied himself with self-control to such an extreme, that the renowned one would only eat once an entire week, and during a period of thirty entire years he did not eat a complete loaf of bread. He exercised therefore every form of virtue, and the thrice-blessed one attained such a height of ascent, that he was made worthy to perform extraordinary miracles. He was the only one, along with another brother, that could see his disciple Basil, who was the first to inaugurate a new cemetery (which the Saint had built for the remembrance of death) by his death and was buried there in a grave, standing after his death with the other brothers in the church and chanting with them, although to everyone else he was invisible. He had lit the unlit coals without fire at the place where he was to establish the foundation of the monastery. He delivered a woman from a flow of blood that approached him with faith. He from one grain of wheat, which he blessed, caused the storeroom of the wheat to overflow. He appeared invisibly, and removed the child from the depths of a well which he had fallen into. He also ceased the death of children of a woman, who before they were born into this life, would be taken by death. This mother had not become better after being totally barren, but the Saint caused her to be able to have many children by his prayer. The Saint also banished a cloud of locusts by a mere censure. He also kept the commander of the army of the East named Kerykos from being wounded at war, for he had garbed himself with the robe of the Saint made of hair and it was like protective armor. And the earth condemned unjustly to famine and unable to sprout, he liberated from its dryness, by bringing down rain by his prayers. The Saint also foretold the destruction that the city of Antioch would suffer by an earthquake. He also rescued many people from a storm at sea, by appearing to all those who were in danger. He was also a teacher of virtue to many disciples, and urged many to have the same zeal and imitate his own virtue through his words and deeds, and this followed with them entering into the household of the Lord. After conducting himself in this manner, and being glorified on the earth, he reposed in peace, and delivered his spirit into the hands of God. 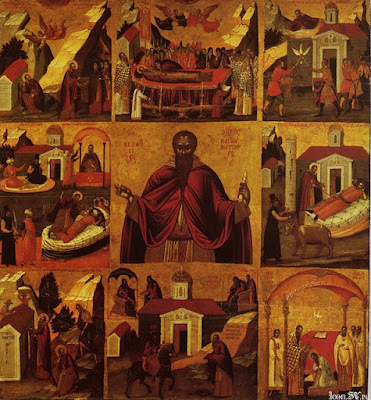 His Synaxis is celebrated in the apostolic Temple of the Chief Apostle Peter. With the rivers of your tears, you have made the barren desert fertile. Through sighs of sorrow from deep within you, your labors have borne fruit a hundred-fold. By your miracles you have become a light, shining upon the world. 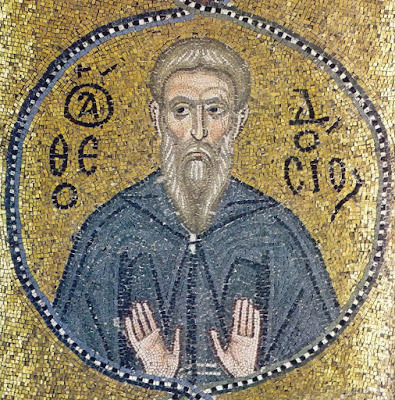 O Theodosios, our Holy Father, pray to Christ our God, to save our souls. 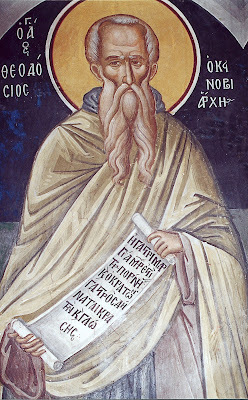 Thou didst shine forth in God-given virtues, O venerable Theodosios, and wast an illustrious model of the monastic life. Thou wast seen as a God-like light and leader, the emulator of Angels and servant of the Trinity. Pray to God unceasingly to have mercy on our souls. As being planted in the courts of Christ thy Lord and God, with holy virtues thou delightfully didst blossom forth and didst multiply thy children amid the desert, who were watered with the showers of thy fervent tears, O chief shepherd of the godly sheepfold of our God. 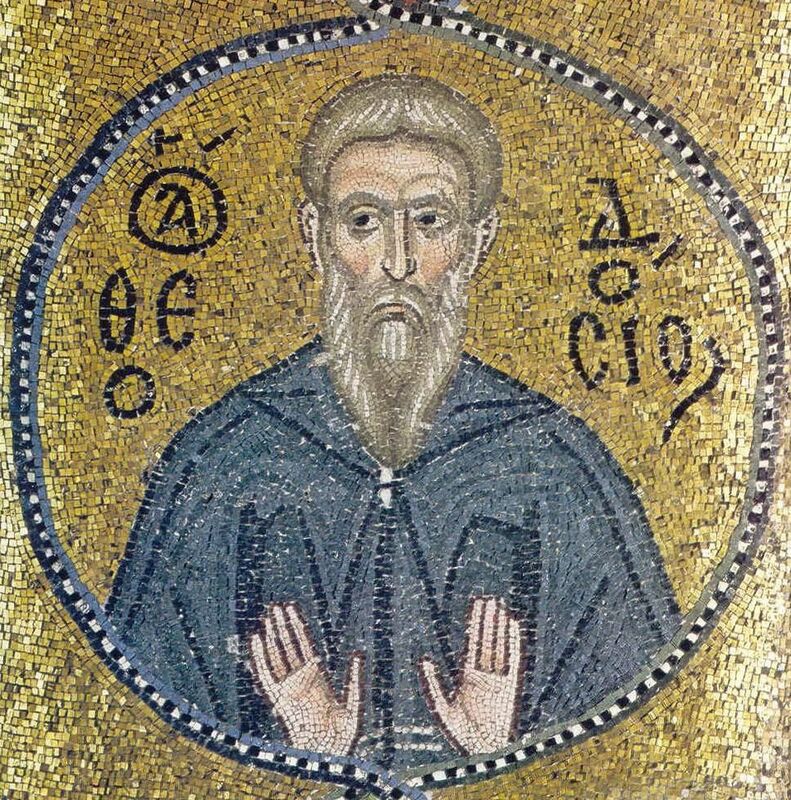 Hence we cry to thee: Rejoice, O Father Theodosios.